So how do you make the coolest Star Wars toy ever even cooler? Having finally given everyone an interactive droid they can call their own, later this year Sphero will also be giving Star Wars fans the ability to control BB-8 using the Force—or at least motion-tracked gestures that will make you feel like a Jedi. 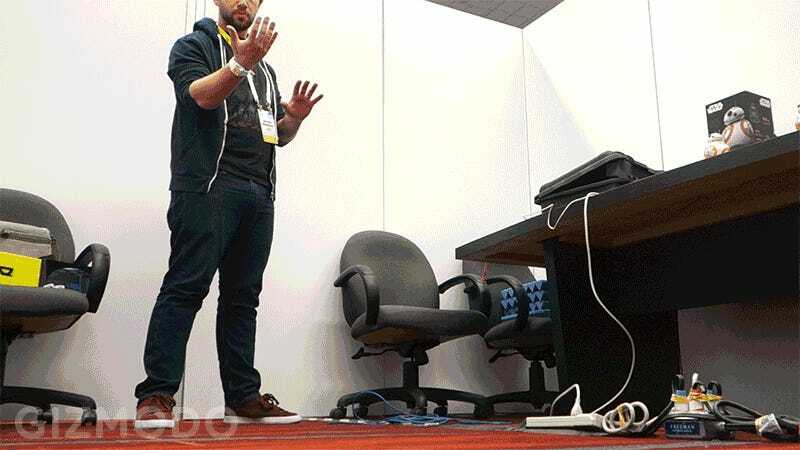 Earlier today at CES, Sphero demonstrated the prototype hardware of its upcoming motion-tracking wearable that’s designed to pair with and control the company’s insanely popular rolling BB-8 toy. 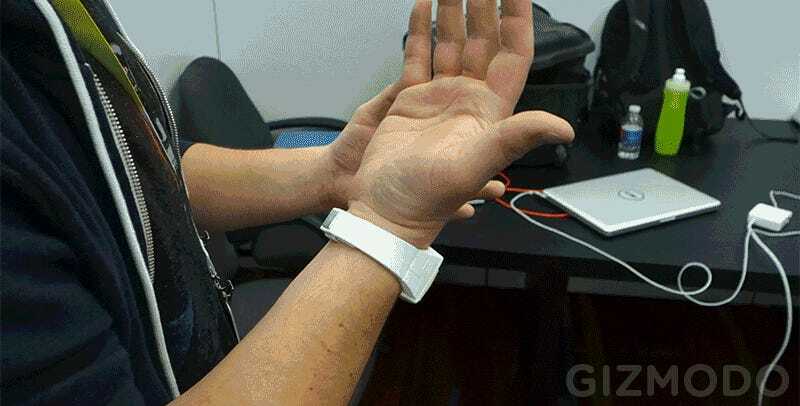 The production version of the wearable will look completely different when it ships later in the year, the company assures us, but functionality will be very similar to what was demonstrated for Gizmodo today in Las Vegas. Instead of sliding your finger across a set of virtual controls on the touchscreen of a smartphone or a tablet, Sphero’s new wearable is packed full of ultra-sensitive gyroscopic motion sensors that track the subtlest of Jedi movements, and then translates them into commands for BB-8. In addition to sending the tiny droid rolling away and then calling it back using push and pull motions, the wearable can also be used to precisely steer it around obstacles (how often has your BB-8 gotten stuck somewhere?) and trigger pre-programmed moves. Depending on how you hold your arm and what motions you’re making, there are various control modes, indicated via a color-changing LED on the prototype hardware, letting you even control BB-8’s head movements so the droid can respond to other people interacting with it. It’s far too early for Sphero to divulge pricing info for the new accessory, but in a roundabout way it will actually make the BB-8 toy slightly more affordable because you no longer need an expensive smartphone or tablet to play with it. The wearable interacts with the rolling droid all by itself, without the need for the Sphero app running on expensive hardware. 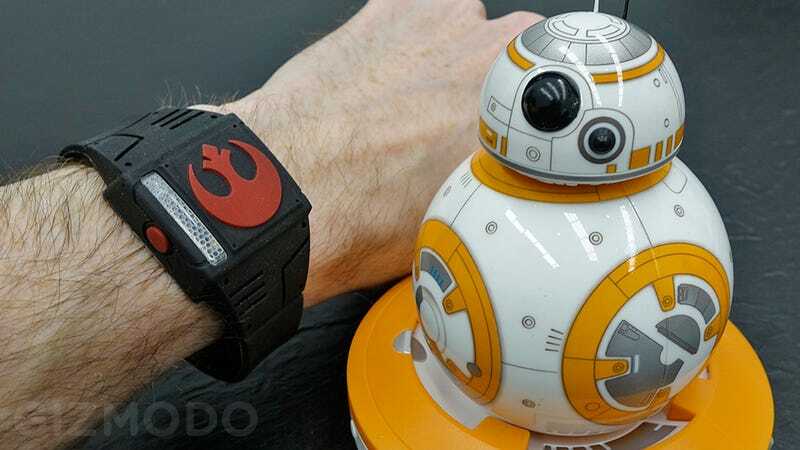 When finally available the wearable will be sold as a bundle with Sphero’s BB-8, or on its own for every one who already has one of the RC toys, but is tired of being completely dependent on the touchscreen app for interacting with it. And if you’ve seen the movie and find you prefer the worn-out look on BB-8 instead of the original shiny version, Sphero will also be selling a new ‘battle damage’ edition of the droid that has clearly survived an adventure or two.